John F. Kennedy stayed at the historic Edgartown Inn and Nathaniel Hawthorne spent over a year there writing Twice Told Tales. 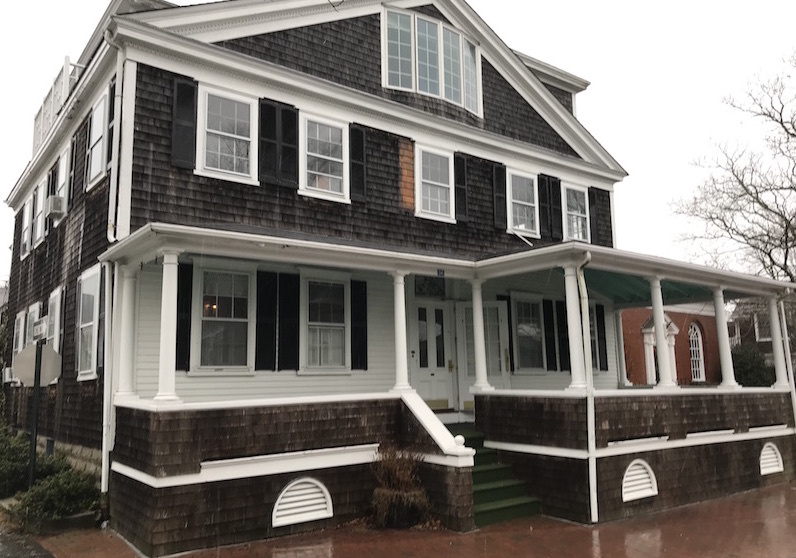 The historic Edgartown Inn has been sold to Milton-based real-estate investor and hotelier Charles C. Hajjar for $5 million. The Inn, nestled on North Water street near the Edgartown harbor and Chappy ferry, dates back to the 18th century and has served as a favored stopping-off point for congressmen, senators, and even a president. Rooms in the main house are named for some of the Inn’s illustrious guests, such as Daniel Webster, abolitionist Charles Sumner, and John F. Kennedy. In the 19th century, Nathaniel Hawthorne spent over a year at the inn while he wrote Twice Told Tales. The inn’s main house has 12 rooms, with two adjoining rooms in the smaller “Garden House.” Mr. Hajjar’s purchase contains both structures, located respectively at 56 and 60 North Water street. Chappaquiddick resident Earle Radford, originally from Kansas City, Mo., purchased the inn in 1975 and supervised its operation as a quaint, Victorian-styled bed-and-breakfast until his death in 2007. The inn stayed with the family for the next decade before it was sold to Mr. Hajjar. The transaction closed on Dec. 21. Along with the newly-purchased Edgartown Inn, Mr. Hajjar owns The Richard, The Sydney, and The Christopher hotels through his firm, Hajjar Management Company. All three boutique hotels are located in the heart of Edgartown and are operated by the hotel management company Lark Hotels, which also manages the Summercamp in Oak Bluffs. Oh no. Will the Inn be kept as an Inn? We've known Sandy a long time. What will happen to this quaint historic inn? Well, it's been sold to new owners for $5 Million. Chuck and Anne are great hoteliers and will bring style and grace to the Edgartown Inn. This is extremely concerning. We have spent every vacation at the Edgartown Inn for the past 25 years. I hope they respect its history and its antiques and don't destroy its bones. It's a wonderful inn that Sandi ran perfectly all these years. I hope not much changes and it continues to offer those great breads at breakfast and that Sandi remains a major part of The Exgartown Inn!! The Hajjars are great people doing great things for Edgartown. Anne will bring her sense of style to the inn as she has down for their other 3 properties. Good luck! Very good point and I'm hopeful if the new owners are sharp they know that there are a variety of guests who have different tastes of styles. The Edgartown Inn respected its heritage and was decorated to honor timeless, period classics. I agree with you and hope the style is retained!! It breaks my heart to read this article. The Edgartown Inn has been my summer vacation spot for 35 years. No one but Sandi could ever match the style and grace that has been part of the Inn all these years. Unless the Inn is kept as the charming antique-filled Inn it has always been , and Sandi is at the door to greet me upon my arrival, why return? Not a good way to start 2019. I agree with above comments . People come from overseas to stay in this historical Inn . I used to work there serving the amazing breakfasts as a summer job. Wonderful place . I have been back with my husband from the UK and hope to bring my children soon for their summer holidays. Pls keep the history and the ethos that Sandi and all the old staff has it was very much valued . Money won't guarantee the significant and unique charm and vibe of The Edgartown Inn! Sandi's hospitality and way with guests cannot be replicated and carried over. As George Harrison said, "All things must pass". I'm sure the new Inn will be beautiful and charming and this family's newest chapter will be exciting and meaningful for them - the Inn will be reincarnated once again. We migrated south from Canada for many years to stay at the beautiful Inn, but in all honesty we stayed there BECAUSE of Sandi who was always so kind and so skilled. She worked so hard to make the Inn feel like home and make us feel like family. She always had such a wonderful staff who were committed and kind. Remember also all of the lovely summer students from Romania and Ukraine that she mentored? it really was Sandi who we went to see. It was lovely for Earl's family to keep the Inn open for ten years after his passing. We feel so very fortunate to have known the Edgartown Inn experince. We will miss Sandi and that incredible coffee cake! We are thankful for the memories. Since hearing rumors that the Edgartown Inn has been sold, I have been concerned that the name might change...It is wonderful to hear that the new owners will keep the name, and it will continue to be the only Edgartown Inn in the world, I dare say! The Hajjar have been honest and first class with their other operations to date. We are fortunate to have a caring hands on team to rejuvinate our inns. I have heard nothing but great things about their interest in the Island. They are young, imaginative and very generous to charitable organizations here and in Boston. I believe that their touch will enhance what already is a great historical Inn. Better to have locals than absentee ownership. This should be great for Martha’s Vineyard and especially Edgartown. I couldn’t agree more. I like your positive take on this change. The new remodels of the old historic homes and hotels do not reflect or celebrate Island history which is quite rich. Would love to see some of the interior paint colors and furnishings that are specific to the period when these structures were built be woven in to any refreshing or even re-branding. Hate to see these places look like "Anywhere, USA" - or slaves to the latest trends. The Mansion House, Vineyard Haven, has been sold to George H. Heeley of Providence, R.